I will not make the common mistake what most of the reviewers of this film has done, that is to compare the film with time travel genre like "memento" and "blast from the past" or may be "The Lake House". To be honest I find it a heresy to compare a Hollywood commercially released film with experimental films like Memento. Most of the film reviewers who pick up the name of "Memento" in utter disdain today would have filched after their first screening of Memento, while they were busy reviewing some commercial film from the mainstream Hollywood. It is only now that everybody seems to know about Memento. You must have this funny feeling which I call the "after thought" after watching every film. 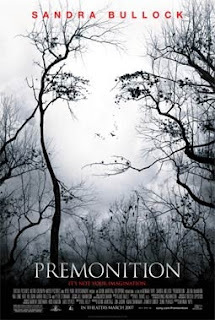 After watching Premonition, your after thought will linger on for a long time, particularly if you live a routine life, which most of us do. Not that you need to be a boring house-wife to live a routine life, most of our lives are intertwined with the same events and emotions and weekend breaks and someday when you wait for your transport, to be picked up from office, you will soon stop wishing good morning to your colleagues, think you already did yesterday and everyday you just do the same, so, why bother today? The fear factor creeps in when this routine is suddenly shaken in the foundation and events just unfold and your routine is completely shattered. Linda Hanson (Sandra Bullock) learns that her husband, played by Julian McMahon, died in an accident; the next day, she finds him alive. She eventually realizes that she is living the days of her life out of order, and that these premonitions might give her a chance to keep her family together by saving her husband from an untimely death. But, as one premonition leads to another, Sandra Bullock's character becomes increasingly aware of hidden facets to her husband's life. Therein lies the conundrum she must deal with as she struggles between her love for her husband and her disdain for his secret life. Does she use her great premonition for good or simply let the gift of future knowledge fall by the wayside? so, each day ends and it opens up to the next day with a short fade to black, at this very second, you will gear yourself up for the next day, and see how Sandra Bullock will manage to change her life. The ending comes as a shocker, and your will remember the brief encounter with faith, when Sandra Bullock visits a priest to help her understand her situation. I like the wide expanse of Sandra Bullock's acting, seems like really wide from the funny detective in Miss Congeniality to Murder by Numbers. She has managed to give low key good performances and provided us good intriguing films. Her co-stars have also done a good job, and giving the complex narrative, I think Bill Kelly turns a new page in non-linear narrative films.